The essential collection of beloved ghost stories, compiled by the editor who helped define the genre—including stories from award-winning, bestselling authors such as Joyce Carol Oates, Alice Hoffman, Seanan McGuire, and Paul Tremblay. 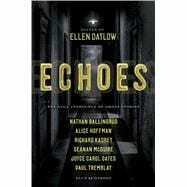 Everyone loves a good ghost story, especially Ellen Datlow—the most lauded editor in short works of supernatural suspense and dark fantasy. The Saga Anthology of Ghost Stories is her definitive collection of ghost stories. These twenty-nine stories, including all new works from New York Times bestselling authors Joyce Carol Oates, Alice Hoffman, Seanan McGuire, and Paul Tremblay, span from the traditional to the eclectic, from the mainstream to the literary, from pure fantasy to the bizarrely supernatural. Whether you’re reading alone under the covers with a flashlight, or around a campfire with a circle of friends, there’s something here to please—and spook—everyone. Contributors include: Joyce Carol Oates, Alice Hoffman, Vincent J. Masterson, A.C. Wise, M. Rickert, Seanan McGuire, Lee Thomas, Alison Littlewood, M.L. Siemienowicz, Richard Kadrey, Indrapramit Das, Richard Bowes, Nick Mamatas, Terry Dowling, Aliette de Bodard, Carole Johnstone, Dale Bailey, Stephen Graham Jones, Bracken MacLeod, Garth Nix, Brian Evenson, Jeffrey Ford, Gemma Files, Paul Tremblay, Nathan Ballingrud, Pat Cadigan, John Langan.